The next two weekends will be full of games. 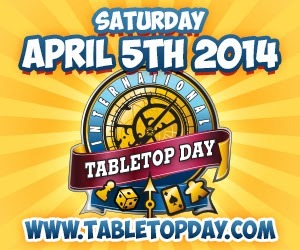 This Saturday is International Tabletop Day, and next weekend is PAX East. I'm thrilled to pieces to be doing something for both events. I created an RPG scenario designed to run from business cards at one or both events. It's an excuse to reach out to fellow gamers and invite them to play something. I'm organizing an event at my church in Shrewsbury, MA. Feel free to stop by between 10 AM and 5 PM if you're in the neighborhood and want to get your game on. We'll be playing games all afternoon, so bring a game you'd like to share. The yearly pilgrimmage to Boston continues apace. We're putting on Tabletop System Wars II on Friday at 10PM in the Beaver Theater, which is the first theater down the right-hand hall from the main entrance on Level 1. Give us your campaign idea and we'll fight about what system you should use. Feel free to hang out and talk with us afterward about whatever. We don't bite unless GMing. Other than that I'll be trying to play as many games as possible in the Tabletop Gaming area. Hopefully we can camp out on a round table this year and just rotate people coming and going. I'll be checking Twitter occasionally, but feel free to mention me (@twwombat) if you want to play something or just hang out and chat. I'm not giving myself many goals this year other than having fun. And not being sick for PAX. And I would like to run The Bospor Incident at least once to dust off my GMing skills. Oh, and meeting/talking with more cool people. 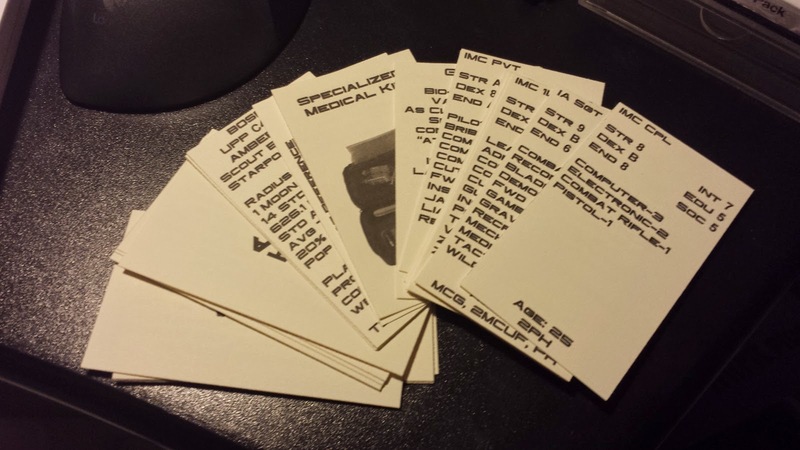 I've got this thing about running an RPG off of cards. I ran my previous D&D 3.5 game off of index cards, which worked out really well. It started with using a stack of cards to track initiative, and then I just added more monster stat cards as the campaign went on. Later I started using cards to track treasure and magic items in a throwback to my LARPing days. 1 CT scenario on 30 business cards. 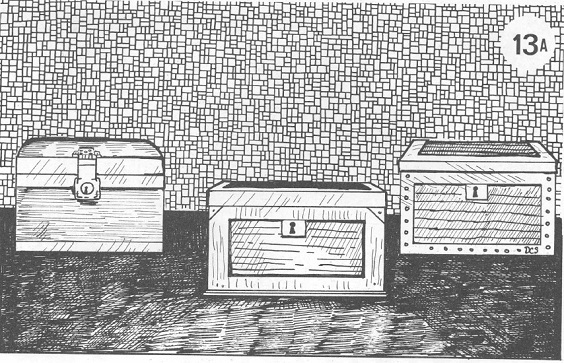 I wanted to run a Classic Traveller game at PAX, so I started with a name: The Bospor Incident. Then I set about designing for business cards. I knew the characters would fit - PCs are a rank, 6 stats, and a list of skills and decorations. Even my most skilled character still fit on one side, so I used the back to track each character's initial gear and contacts (if any). I fit everything I need (I hope) on 30 business cards. I've got 10 pre-generated characters, each on their own card. I've got 10 "Data Points" cards containing bits of information the PCs can discover through research, carousing, and intimidation. These 10 cards form the backbone of the adventure's plot. I've got 3 "treasure" cards detailing stuff the PCs may find, 3 cards for people and critters that may shoot back at the PCs, 2 cards covering Library information on the system and world, 1 combat reference card that condenses relevant weapon info for the PCs, and 1 Orders card which kicks off the whole adventure when the PCs land on Bospor. It took me a while to get the formatting set, and some of the alignment between sides is wonky, but overall I'm happy with what I've got. I'll be laminating the cards and bringing dry-erase markers to track hits and ammo. One paper towel later the game resets, ready to run again. Best of all, I can fit the whole stack in an index card box and still have enough room for dice and pens. I think that's just cool. 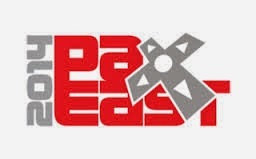 I'm hoping to run The Bospor Incident at least once at PAX. Please let me know if you're interested in playing, or if you just want to look through the cards to see how it fits together. The limited space forces you to skip to the really important things, sort of like flash fiction. That appeals to my editor's brain. And yes, I think I'll create more games on cards. Stay tuned as I get inspired with and by future projects.